I saw my friend B yesterday and we had a small conversation through car windows. "You should see the little piglets down at the Goodnight farm. They are so cute," she said. I squealed in delight at the thought of taking photos of baby pigs. 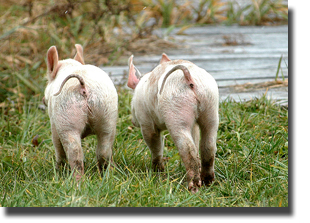 I had all kinds of preconceived notions in my head of the warm fuzzy piggie images I might share with you today. 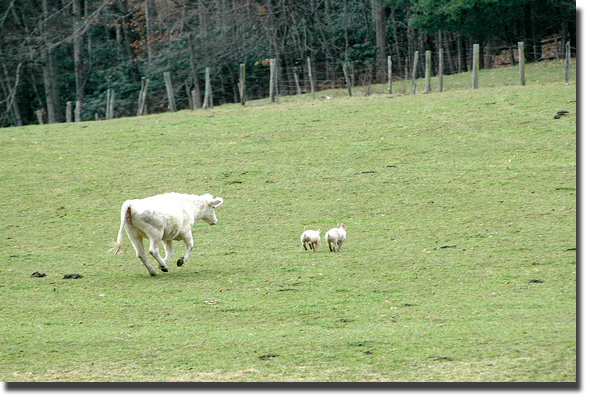 As I drove up to the Valle Crucis farm I saw one piglet in a comfy-looking fenced in area and the other outside the cage exploring the gardens. 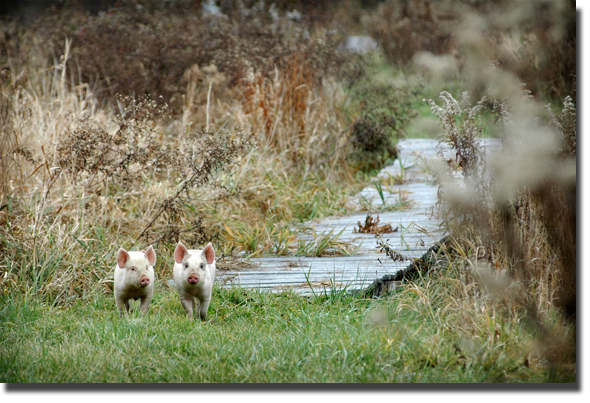 As I got my camera gear ready I witnessed the other pig escape to join his friend. The pair wandered down a grass path towards a wetland. I followed to see just what sort of antics they would get into. I realized there was not a thing I could do on my own to get the oinkers back in their pen, so I watched as they crossed Dutch Creek Rd and onto the Taylor's property. I saw the herd of cattle regard the little piggies and I briefly wondered how the cows would react to the intruders. The piggies were not happy with their cow encounter as they went "wee wee wee" into the safety of the woods. And, they haven't been seen since.